Thank you hopefully biography Biography and Profiles. Benefit for you to know more figures in the world, General Sudirman is one of the most popular figures in the history of the struggle of the Indonesian nation. He was the first commander of the military, religious leaders, educators, Muhammadiyah leader and a pioneer of guerrilla warfare in Indonesia. General Sudirman also one of the five-star general in Indonesia besides General AH Nasution and General Suharto. He was born in Bodas Karangjati, Purbalingga, Central Java, on January 24, 1916 and died in Magelang, Central Java, January 29, 1950 at the age of 34 years of tuberculosis and is buried at the Heroes Cemetery in semaki State Kusuma, Yogyakarta. 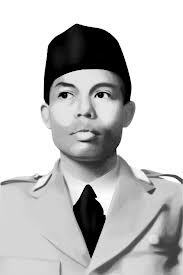 General Sudirman was born and raised in a modest family. His father, KARSID Kartowirodji, was a worker at Sugar Factory Kalibagor, Banyumas, and his mother, Siyem, bleary-eyed offspring Wedana Apex. Soedirman since the age of 8 months was appointed as a child by R. Tjokrosoenaryo, an assistant district officer Apex is still a brother of Siyem. General Sudirman acquire formal education from the School Garden Student. Then he went on to HIK (school teacher), Muhammadiyah Surakarta but not until the end. Sudirman was also active at the moment Scouts organization Hizbul Wathan. After that he became a teacher at his school in Cilacap Muhammadiyah. The knowledge gained from the Japanese military through education. After completing his education at the MAP, he became a battalion commander in Kroya, Central Java. Later he became the commander of Division V / Banyumas after TKR formed, and eventually was elected Commander of the Armed Forces of the Republic of Indonesia (Commander TKR). Sudirman was known to have a private firm on principle and conviction, he always put the interests of many people and nation above personal interests, even the interests of his own health. His personality is written in a book by Tjokropranolo, bodyguard during the guerrilla, as someone who is always consistent and consistent in defending the interests of the homeland, the nation and the state. During the Japanese occupation, the Sudirman been a member of the People's Food Board and a member of the House of Representatives residency of Banyumas. In this time he set up a cooperative to help the people from starvation. After World War II, the Japanese surrendered unconditionally to the Allies. Sukarno used the moment to declare the independence of Indonesia. Sudirman and his troops fought in Banyumas, Central Java against the Japanese and captured weapons and ammunition. At that time the Japanese position is still strong in Indonesia. MAP Soedirman organizing his battalion into a regiment based in Banyumas, to become the army of the Republic of Indonesia which then played a major role in the war Indonesian National Revolution. After the People's Security Army (TKR) was formed, he was subsequently appointed as Commander of Division V / Banyumas with the rank of Colonel. And through TKR Conference on 12 November 1945, was elected Soedirman TKR Commander / Chief of the Armed Forces of Indonesia. Later he began to suffer from tuberculosis, but he still falls within the guerrilla war against the forces who want to master the Dutch NICA Indonesia after the Japanese surrender. The first great war is a war led Soedirman Palagan Ambarawa against the British and Dutch NICA which lasts from November to December 1945. In December 1945, forces led by Sudirman TKR fought against the British army in Ambarawa. And on December 12, 1945, Sudirman launched simultaneous attacks against all top notch British Ambarawa. Famous battle which lasted for five days to end with the withdrawal of British troops to Semarang. The war ended on December 16, 1945. After victories in the Sudirman Ambarawa Theater, on December 18, 1945 he was appointed as General by President Soekarno. Soedirman gained the rank of General is not through the military academy or other higher education, but because of his achievements. General Sudirman still plunge into battle during the second Dutch military aggression in the capital Yogyakarta. When the capital was moved to Yogyakarta, Indonesia as Jakarta has mastered Belanda.Soedirman led his troops to defend Yogyakarta from the Dutch attack was on December 19, 1948. In opposition, the health condition of General Sudirman was in a very weak state of tuberculosis he suffered for a long time. Yogyakarta was then controlled by the Dutch, although Indonesia was ruled by the army after General Offensive March 1, 1949. At that time, President Soekarno and Mohammad Hatta and several cabinet members were also arrested by the Dutch army. Because of the precarious situation, Soedirman crutches left with his troops and return to guerrilla warfare. He moved around for seven months from one forest to another forest, and from mountain to mountain in sickness almost without treatment and medical care. Soedirman home of guerrilla because his health condition does not allow her to lead the Armed Forces directly. After that just a figure Soedirman planners behind the scenes in a guerrilla campaign against the Dutch. After the Dutch surrender as the Indonesian archipelago States in the 1949 Round Table Conference in The Hague, General Sudirman back to Jakarta with President Sukarno and Vice President Mohammad Hatta. At the date January 29, 1950, General Sudirman died in Magelang, Central Java illness suffered severe tuberculosis. He was buried in the Heroes Cemetery in semaki State Kusuma, Yogyakarta. He was named the Defender of Independence hero. In 1997 he was awarded posthumously to Major General of the five-star rank possessed only by a few generals in Indonesia until now.